Can We Predict the Next Indian Mega-Famine? The original article is behind a pay wall. 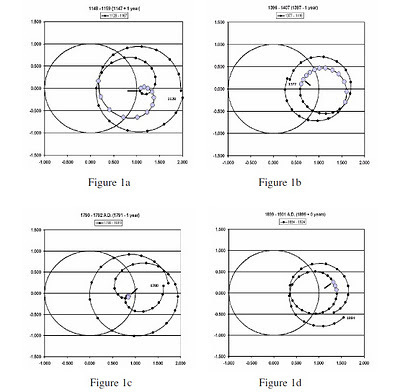 It is published in Energy and Environment, Vol. 20, No. 1-2, Jan 2009. Wilson et al.’s (2008) prediction of reduced solar activity (starting with sunspot cycle 24), combined with the results of this paper, lead us to predict that there could be as much as a 1-in-4 chance that the Indian sub-continent will suffer a catastrophic multi-year failure of the summer monsoon, starting sometime between 2018 - 2020. Potentially, this mega-famine could lead to massive food shortages across large sections of the Indian sub-continent, resulting in millions of deaths. Catastrophic multi-year failure of the Indian monsoon has caused at least eight mega-famines in India over the last 1100 years. Historical data shows that seven out of the eight mega-famines have either started within ± one year of the year of greatest asymmetry in the Sun’s motion about the Solar System’s centre-of-mass, or 11 years ± one year after this event. The Sun is currently experiencing a maximum in the asymmetry of its motion about the centre-of-mass. Evidence is presented to show that there is almost a 1-in-4 the chance that there will be another Indian mega-famine in 2018-20. While the chance of such a catastrophic event occurring is small, it is large enough that the governments on the Indian subcontinent should take precautionary measures to confront this potentially devastating threat. Table 1 lists the eight mega-famines included in this study, their duration and a brief historical description of each of the famine’s effects (Maharatna 1996). 1876 – 1878 3 5,000,000 people died in India. a) Chauhau (2007) writes that: “For seven years from 1335 famine was rampant throughout Northern India, when Muhammad Tughlak ordered the evacuation of Dehli to Deogiri in the Deccan.”. If this claim is true, then this famine may have started in 1335 and reached its peak intensity in 1344 – 1345. This would make it a likely mega-famine candidate. b) The “1661 famine [was] due to drought - no rain since 1659” so it is possible that the effects of the famine may have lasted for up to three years (Ayton 2006). c) The All India Summer Monsoon Rainfall (AISMR) was more than 26 % below normal in 1899 and 15 % below normal in 1901, so it is plausible that famine-like conditions may have prevailed for the full three year period from 1899 to 1901. However, it must be acknowledged that this is the weakest mega-famine candidate because of its relatively low severity. Further support for our choice of mega-famines candidates is provided by a study done by Sinha et al. (2005). This study uses δ18O records from stalagmites in caves at Dandak, India, to detect periods of extended drought. Allowing for uncertainties in their dating calibrations between the years 800 – 1000 and after the year 1500, it is possible to use their data to identify the first five mega-famine candidates listed in Table 1. Their data also shows periods of extended drought associated with the earlier possible meg-famine candidates in 650 and 879. However, these two famines are not included in our sample because we do not know exactly when they started and how long they lasted. 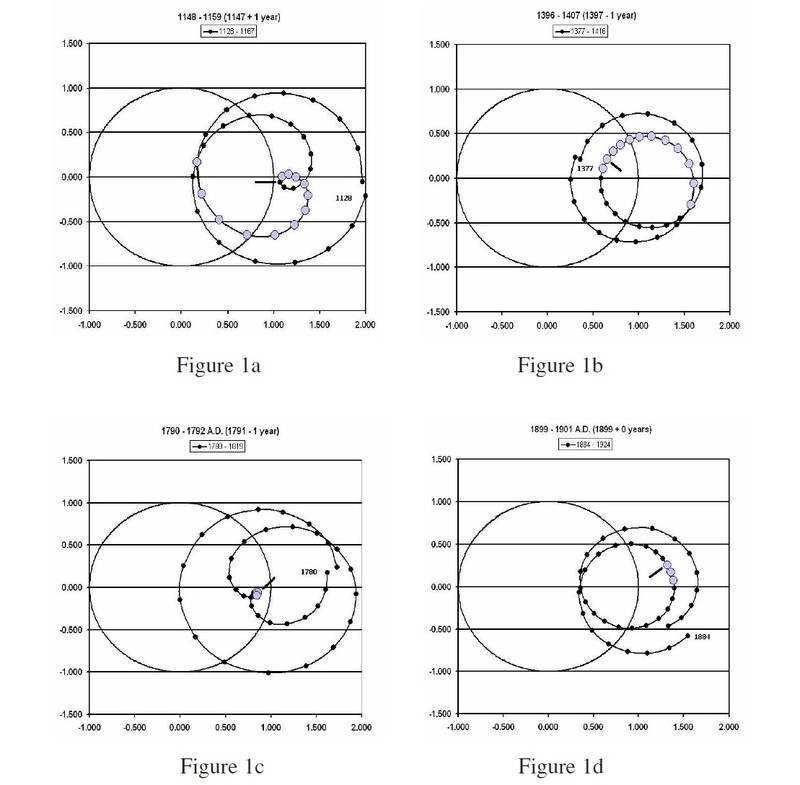 Shown below are the four out of the eight recognized Indian mega famines that occurred within plus or minus one year of the maximum asymmetry of the Solar motion about the Solar System's barycentre. 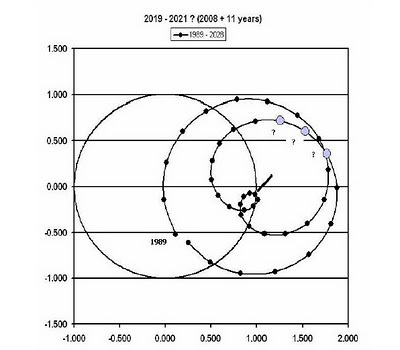 The three of the remaining four Indian mega famines started withing plus or minus 11 years of the maximum asymmetry of the Solar motion about the Solar System's barycentre. The following graph shows that there is a 1 in 4 chance the the next Indian mega famine could start sometime between 2018 and 2020. Finally, it should be emphasized that the chance of a mega-famine occurring is only 1-in-4, and so there is a 3-in-4 chance that it will not occur. However, we believe that chance of this terrible tragedy is high enough that the Indian, Pakistani and Bangladeshi governments should consider making some contingency plans to help mitigate the huge potential loss of life.